IASB Deputy Executive Director Ben Schwarm and Director Deanna Sullivan recently sat down with Assistant Director Zach Messersmith to discuss Governor Bruce Rauner's budget address, what may be in store for the coming year, and how long it could take before a finalized budget is approved. 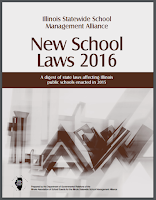 The Illinois Statewide School Management Alliance recently compiled and distributed a publication to inform school leaders about new laws and changes in existing laws made in the year 2015 and taking effect in 2016. The Alliance is comprised of the Illinois Association of School Boards, the Illinois Association of School Administrators, Illinois Association of School Business Officials, and the Illinois Principals Association. Included in the document are 64 new laws impacting school districts, including concussion protocols, civics course requirements, student discipline, teacher licensure and reciprocity, accountability, health and safety concerns, as well as several Tax Increment Finance bills. Also included in this publication is IASB Policy Reference Educational Subscription Service (PRESS) information regarding new legislation, where applicable. If a new law requires action by the school board, the corresponding PRESS policy number will follow the public act information. This publication has been mailed to district superintendents, business officials and principals, along with each school board’s legislative liaison and president. The complete document is also available online; click here to access. Education stakeholders in Washington, D.C., have been very busy since the passage of ESSA working on the implementation. The House Education & Workforce Committee held a hearing on February 10, which focused on ESSA implementation and strengthening local governance. The Senate will hold a similar hearing on February 23. Click here to read the complete Federal Legislative Report 114-8, including more on ESSA, proposed "white collar exemptions" in labor regulations, school nutrition reauthorization, federal education budgets, and health care and education. 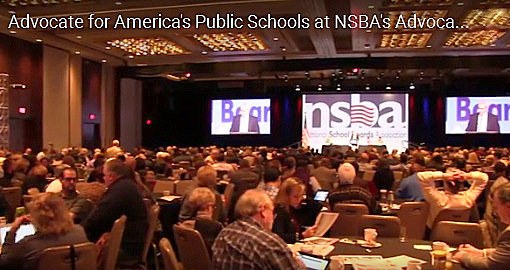 An NSBA website promotional shot shows last year's event. The Advocacy Institute, which has been rescheduled for June 12-14 due to the blizzard that hit Washington, D.C. in January, will re-open registration on Feb. 23. All event registrations from January were rolled over to the June institute; however, registrants must make their hotel reservations again with NSBA’s housing company to ensure the group rate. Contact NSBA at 1-800-950-6722 or email to registration@nsba.org, with any questions or concerns. Visit the NSBA website for more information about the Advocacy Institute. 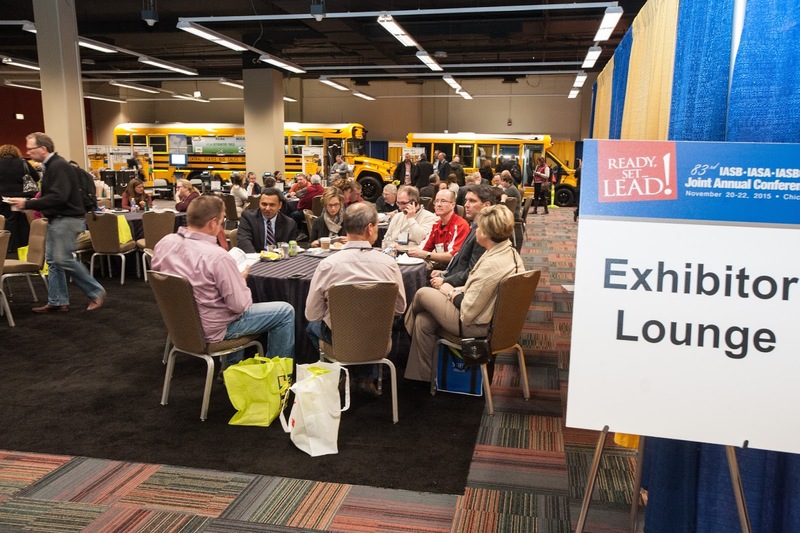 The 2015 Joint Annual Conference drew 1,224 exhibitors. IASB has posted information for registration and housing for all exhibitors planning to attend the 2016 Joint Annual Conference. Information and forms were posted online Feb. 12. Registration and housing forms can be downloaded as a fillable PDF; however forms cannot be submitted online. Forms will be accepted by fax or email if payment is made by credit card. If payment is made by check, forms must be submitted by mail to IASB, 2921 Baker Drive, Springfield, 62703. “We will do our best to assign the same booth space as last year or the closest space to the booth requested for those who get the contract signed early,” said IASB Meetings Management Assistant Director and Exhibit Manager Dana Heckrodt. Instructions and forms are posted here. Now in its 84th year, the Joint Annual Conference has welcomed exhibitors for the past 68 years. The Conference is proud to have vendors that have exhibited annually for 10, 20, and even 30-plus years. 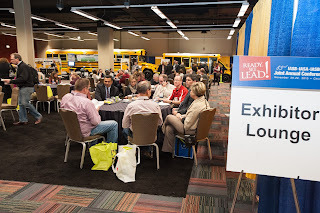 It annually draws nearly 10,000 school leaders and guests. 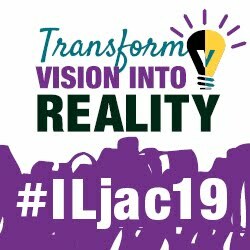 This year’s conference will be held Nov. 18-20 in Chicago. The exhibit hall will be open on Friday and Saturday. Questions about exhibitions, forms, or procedures, should be directed to IASB Meetings Management at 217/528-9688, ext. 1115. 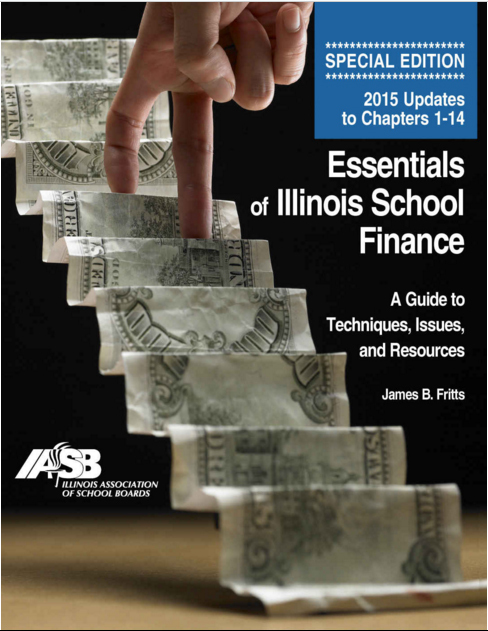 Since it was first published in 2002, Essentials of Illinois School Finance has been a mainstay for Illinois universities that teach school finance classes to prospective school administrators. Newly available is the latest version – a special edition in consideration of the ongoing budget stalemate in Illinois. The author, James B. Fritts, has continued his work on other parts of the book and updated the essential financial, statutory, and regulatory data wherever possible. The scope and purpose of the book, sub-titled “A Guide to Techniques, Issues and Resources,” remains the same. The first part of the book deals with revenue — where schools get it, how they maximize it, protect it, manage it and plan for it. The second half of the book addresses expenditures — how schools budget for them, reduce them, and make plans to deal with them. Together, the two sections provide a solid base for financial management and long-range planning. This special edition is only available in “e-book” format, which is a first for IASB. This was done in order to meet the timeline needs of university customers as all parties deal with Illinois state budget delays. In addition to timeliness, the new e-book edition is searchable and offers bookmark, highlight, and note-taking utilities and live links. For more information, visit the IASB online bookstore, or go directly to Essentials of Illinois School Finance at amazon.com. IASB anticipates standard ink-and-paper printing of this and other titles in the future. Until then, if you have comments on the e-book format or require more information, contact srotherham@iasb.com. Decade Level sponsor: Kings Financial Consulting Inc.
Division Meeting sponsors: GCA Education Services, Inc.; Larson & Darby Group; Legat Architects, Inc.; OpTerra Energy Services; and Wight & Company. The IASB sponsorship program provides opportunities for individuals and organizations to provide financial sponsorship to support and enhance all of the division meetings program purposes: board member professional development, networking, peer recognition, association governance, and learning about resources available from IASB. For more information about division meeting sponsorship opportunities, contact Cathy Talbert, associate executive director, field services and policy services, at ext. 1234, or email her at: ctalbert@iasb.com. IASB staff presenters shared ideas with 45 division leaders. Forty-five school board members recently attended the second IASB Division Leadership Workshop, designed to strengthen leadership skills, network with other division leaders, understand their roles and responsibilities, and be recognized for service to the Association. “This is where you get a voice,” one division leader noted about division governance and the opportunity it gives to local school boards to discuss challenges and concerns with similarly situated boards and with IASB leadership. Participants commented favorably on the workshop, which helped them develop awareness of how they can make a contribution in their leadership position, network with others in similar roles and with shared ideas, and learn more about IASB, especially the differences in leadership challenges among the 21 divisions. As the state is in the middle of the eighth month of the fiscal year with no budget in place, Governor Bruce Rauner delivered his annual Budget Address today before a joint meeting of the Illinois General Assembly. Stating that 2016 cannot be a repeat of the budget failures of last year, he laid out two options from which the legislature must choose to implement a budget. Option two would be for the legislature to approve a general budget along with legislation to give the governor authority to make cuts where he feels it is necessary in order to balance the budget. Click here to read the full Alliance Legislative Report (99-37), including the governor's call to prioritize education funding. The newest member of the Chicago Board of Education will also serve as the latest appointment to the Illinois Association of School Boards (IASB) Board of Directors. Jaime Guzman accepted a position on the Chicago District 299 school board on Jan. 11, filling the vacancy left by former member Jesse Ruiz. Guzman was also elected as the District 299 board vice president on Jan. 27. Throughout his career Guzman has held positions in the public, private, and nonprofit sectors. 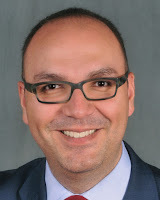 He is currently executive director of the Taproot Foundation, which connects social change organizations and other not-for-profits with skilled volunteers who share their expertise pro bono. Guzman has an extensive career in education, holding positions at the elementary, secondary, and college levels. He has been a bilingual teacher with Teach For America, where he went on to hold the position of program director for the nonprofit’s Chicago division. Guzman was also employed at Chicago Public Schools as a teacher at Kanoon Magnet School, and later in the Office of New Schools, where he managed the authorization of new public schools. He has also served as chief advisor to the City Colleges of Chicago Board of Trustees and as regional director for education at the National Council of La Raza. Guzman replaces Ruiz, who stepped down from the CPS board in December and was appointed to chair the Chicago Park District Board of Commissioners. Ruiz served on the IASB board since 2011. Prior to that, he chaired the Illinois State Board of Education. Guzman is the latest member to join the IASB board. In 2015, seven new members were seated on the board, including Mark Christ (Southwestern), Dennis Inboden (Wabash Valley), Carla Joiner-Herrod (West Cook), June Maguire (Lake County), David Rockwell (Blackhawk), Thomas Ruggio (DuPage), and Denis Ryan (South Cook). 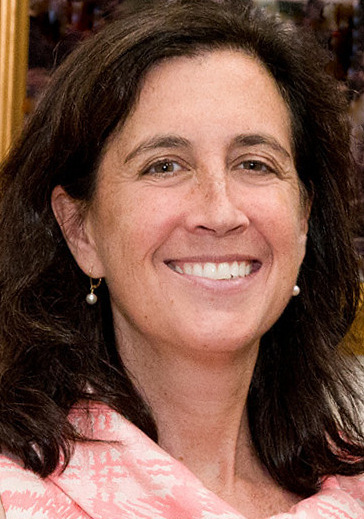 “As a former teacher and administrator with great academic and real-life credentials in education, Jaime will arrive on day one with a special perspective, I believe, which will add to the engaging debate we have underway on how to bolster excellence in local school governance supporting quality public education,” Pritzker said. “Mr. Guzman succeeds a tremendous public servant in Jesse Ruiz; someone who brought value and wisdom to our deliberations. I am confident that Jaime will similarly bring a high level of engagement for our special mission,” he added. The Illinois State Board of Education (ISBE) has released its Fiscal Year 2017 budget recommendation calling for an additional $262.1 million in funds and increasing the Foundation Level to $6,327 per student. The Foundation Level has not been raised since FY 2010 and hasn’t been fully funded at the statutorily required $6,119 amount since FY 2012. In order to align ISBE’s goals of providing an equitable distribution of education dollars, the state board has suggested reallocating the $305 million line item for special education into the General State Aid (GSA) formula. Superintendent Tony Smith says that the change will ensure GSA funds will be distributed on a more equitable basis. If approved, the formula adjustment would benefit 77 percent of Illinois students in districts with the least wealth and the greatest number of low-income pupils. School districts that generate greater local resources and have a smaller amount of low-income students would receive a smaller portion of GSA funding. Losses for those schools would amount to less than one percent of their district’s operating revenue. The complete budget proposal can be found here. A district-by-district analysis of the proposed GSA changes is available here. After reviewing various proposals from vendors to administer a college entrance exam for all Illinois 11th grade students, ISBE selected the College Board. In a change from the past, the College Board administers the SAT. Meanwhile, ACT has filed a protest to the selection, temporarily halting the finalization of the contract, as ISBE has sought to speed up that decision. Because the budget for Fiscal Year 2016 is still not complete, ISBE does not know if funds will be available to pay for the administration of the test this spring. ISBE’s current plan is to provide two spring dates for the test and require districts to choose one. The College Board also offers free, personalized practice testing through a partnership with Khan Academy. Students have access to videos, numerous practice questions, an app, and four practice tests. In order to ease the transition into the new Every Student Succeeds Act (ESSA), the U.S. Department of Education has outlined flexibilities available to states for the 2016-2017 school year. The majority of the 2016 grant funds will continue to use the formula allocations and procedures currently in place, with exceptions relative to educational agency interventions and supports, interventions for English learners, and No Child Left Behind provisions that were excluded from ESSA. Most of ESSA will not go into effect until the 2017-2018 school year. ISBE is in the process of creating a webpage to help guide districts through the changes. In the meantime, questions and concerns should be emailed to essa@isbe.net. ISBE will begin using the I-Star system for the 2016-2017 school year, replacing the iePoint software currently in use. I-Star is a web-based special education database and data management system for all districts and joint agreements. The new system incorporates student and personnel approvals, while also offering an additional individualized education component. Additional information regarding I-Star is available through Harrisburg Project’s I-Star webpage. Materials for the ACCESS for English Language Learners assessment have been shipped to districts later than originally planned, pushing back the timeframe in which tests will be given and collected. Testing should be completed by Feb. 26. Testing materials should be returned to the vendor by March 4. A revised Child Health Examination Form will be available for use during the 2016-2017 school year. The updated form is not required for next year, but will be mandatory for the 2017-2018 school year. All first-time students entering Illinois schools must complete a physical exam, and students entering kindergarten (or first grade if not enrolled in kindergarten), as well as the sixth, and ninth grade must provide proof of examination. The new form can be found on ISBE’s website. The Small Area Income and Poverty Estimates (SAIPE) for 2014 have been released by the U.S. Department of Education. The data will be used by Local Education Agencies (LEA) to determine funding eligibility for Basic, Concentration, Targeted, and Education Finance Incentive grants. ISBE will be using these numbers to calculate 2016-2017 Title I, Part A allocations. School officials and Title I directors should review the data closely as this information will determine whether the LEA may be gaining or losing in eligibility for FY 2017 Title I funds. The challenge period for the SIAPE estimates ends on March 8. Information on how to challenge the findings can be found here. From school finance to school governance, the Illinois Association of School Boards will offer a wide range of topics at its 2016 spring division dinner meetings. The meetings begin Feb. 25 and conclude April 25 (click to see complete list). A discussion of legal issues will be presented as a panel or breakout session at eight division meetings. “Trends in the Schoolyard” will include teams of legal experts examining student management issues. Illinois Secretary of Education Beth Purvis will discuss her role and the current trends in “Cradle-to-Career Strategy & Policy” at the DuPage and Lake divisions, while community engagement will be on the menu at the Central Illinois Valley and Three Rivers divisions. School safety and security will also be on several agendas, featuring Paul Timm of RETA Security, and Patrick M. Twomey of Macomb CUSD 185. Ralph Martire, executive director of the Center for Tax and Budget Accountability, school board member and a familiar face at division dinner meetings, will present “The Future of Illinois & State Funding” at four of this year’s meetings. Finance will also be the topic for Jim Burgett of Stifel and Michael Jacoby, executive director of the Illinois Association of School Business Officials. The index of The Illinois School Board Journal is now updated for all issues published through 2015. Journal indices are available by both author and by subject, dating back to 2008. Journal subjects covered in 2015 ranged from administration and assessments, to new media and nutrition, to technology and training. A separate index is also available for articles published in the Illinois School Board Newsbulletin, for the period of January through May 2015. Publication of the Newsbulletin ceased in June, but the same content was reconfigured to appear in the Illinois School Board NewsBlog. All content posted on the blog is fully searchable and indexed through labels on the column to the right. The index for both publications is now available.